Paul McGann is the Doctor in Something Inside. I’m ripping off another reviewer for that joke, but that’s pretty much this story’s modus operand. There are some original ideas buried within Something Inside, but for the most part they’re overshadowed with several clichés and tropes that weigh down both the plot and the characters in the story’s first half. The action, however, picks up at the halfway point of the story and races towards a satisfying, if downbeat ending. Trevor Baxendale is one more in a very long line of prolific Doctor Who writers that Big Finish has has tapped for the main range. He’s penned numerous novels (including Eater of Wasps), short stories, and comic strips as well as an audio story set in the New Virgin Adventure’s continuity, the Seven/Ace/Benny story The Dark Flame. The Dark Flame was a disjointed cut-and-paste “alien artifact causes people to go mad” story that was buffered by strong performances from the entire cast. Something Inside mirrors The Dark Flame by using a very basic story, in this case that of the “base under siege by something unknown” kind. Somehow, this story also serves as a “bottle episode,” a very rare thing for an audio as the characters spend their time either in the interrogation room or running for their lives within the Cube. However, the characters themselves are incredibly flat and one-note. A base-under-siege story should involve a small cast of characters, allowing time to be given over to their development. This way, when one of those characters dies (and they will), the listener has some emotional investment in their demise. Something Inside sadly has very little in way of character development. For the first half of the story, all of the secondary characters are doing one of three things – their assigned job/surviving in a high-stress situation, providing exposition, or running for their lives screaming “there’s no time to explain, run!” Once again, well-used and worn clichés that have been used in stories throughout all of space and time, but when the time DOES come for the tension to ratchet up and these characters to be put in harm’s way or get their just desserts, the listener might not really care about their fate. Even for a Doctor Who story where secondary characters die left and right, there’s very little reason to work up even a whit’s worth of worry for any of Something Inside’s cast when the script gives the listener so little to work with. Within the story itself, clichés abound, though to be fair some of the blame should go to Nicholas Briggs who keeps thing movies briskly but doesn’t quite give the story a chance to find any narrative footing early on. Even for a base under siege story, there’s a LOT of running involved for the first half of the serial and a good bit in the second half as well. Now, throw in amnesia. Amnesia is a tried and true literary device that has been used time and time again through history, so there’s nothing wrong with using it in a story. Indeed, the second half of Something Inside shows us what kind of man the Doctor is without his memories; still someone who will put himself in harm’s way to save someone’s life, still someone who thinks he’s more clever than everyone else, and still someone who has the occasional dark though about someone’s untimely demise, and it’s all done in a way that doesn’t hammer the listener over the head. The problem with using amnesia all comes during the first half of Something Inside where the Doctor doesn’t remember anything and Rawden tortures him as Baxendale’s script combines two things that never go together. Torture rarely, IF EVER, works (though I am a fan of the “put a guy in one room, put someone in the room next door and have him scream like he’s being tortured, go back to the first guy, see what he says” method) so the “I don’t know anything”/”Yes you do” back-and-forth felt like there was no real stake to it, especially since the Doctor really DIDN’T know anything. The Doctor didn’t know anything in the 1996 television movie, lost his memory due to a distortion in the Time Vortex Minuet in Hell, had memories of a pair of previous companions ripped away from him by Davros (Terror Firma), gets attacked by a brain worm (Something Inside), and it’s going to happen to him at least once again in the future (the Eighth Doctor Adventure Orbis). The fact that the Doctor has amnesia AGAIN, especially so soon after Terror Firma, makes that fact less of a “oh, no, what will happen to the Doctor’s memories” moment and more of a “oh, COME ON” moment. Throwing C’rizz in as a “if you don’t tell me what you need to know, I’ll shoot this Eutermesan” method of motivation does add a bit of tension, but without any development beyond “I’m the torturer and this is my assistant” there’s no doubt that C’rizz is going to survive. It’s not like they’re just going to kill C’rizz off, after all. But McGann does pull off the line, and does so very well. 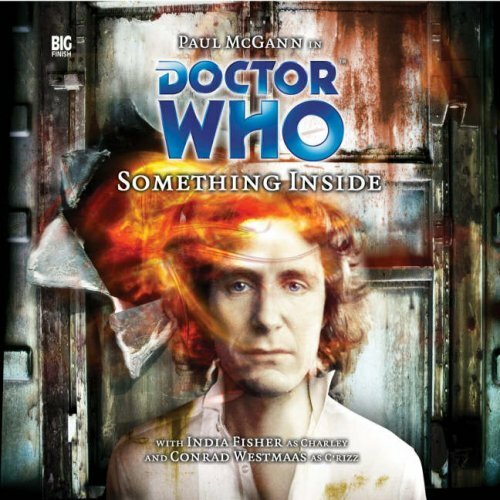 Something Inside gives listeners a fine performance from Paul McGann as he plays a man who has no memory, but still remember who he is. In a lot of ways, this is the Doctor without any sort of filter. In this story, he’s not walking in eternity as his memories are gone, but his personality traits and quirks, the very things that make the Doctor THE Doctor are still there. While being tortured by Rawden and Twyst, McGann sounds almost bored with the proceedings, because he’s been tortured by the “best” after all, and doesn’t start to care until a complete stranger named C’rizz is brought in to be tortured in his stead. Once the still-amnesiac Doctor breaks into the Cube, he becomes concerned with stopping the brain worm and keeping it contained within the prison. McGann channels both the canniness and the resolve of the Doctor during the third act cliffhanger, as he deduces the nature and the location of the brain and worm and flat out challenges it to a fight. Again, imagine any other actor pulling off the line “come on, then. If you’re hard enough.” McGann can. McGann does. I know I’ve been knocking C’rizz for most of his appearances in the main range alongside the Doctor and Charley. I should point out that it’s been the writing and characterization of C’rizz that I’ve had concerns with, and not Conrad Westmaas’ job in the role. The strong performance with weak material continues with Something Inside. Ever since returning from the Divergent Universe, we’ve been given snippets of just what C’rizz is capable of. We’ve learned that the personalities that C’rizz “saved” during his time as a monk with the with the Church of the Foundation exist as voices inside his head. We’ve learned that he can change color and personality to better blend in with his surroundings. We’ve learned that, when pushed, he’s capable of inflicting great suffering. And in this story, we find out that C’rizz does indeed posses a form of minor telepathy that protects his mind from being probed by outsiders. Put together, all these traits have the potential to make C’rizz an interesting character, but so far nothing’s really been DONE with them. Instead of utilizing C’rizz existing traits to drive the story forward, writers seem to just be adding more and more unique characteristics and then failing to follow up on any of them outside their current story. Indeed, the only trait we see from C’rizz in this story is the barely controlled anger that listeners heard in Other Lives. Westmaas is fine in this story, but that’s really it. He’s just…there, serving to motivate the Doctor to talk, to serve as someone for the villains to bounce questions off of, and having his potential demise from internal injuries serve as a key factor in the Doctor’s deduction of the brain worm during the third episode’s cliffhanger. The only real highlight of C’rizz’s performance is at the very end of the story where he quietly mutters “I couldn’t save anyone,” which is a bit ominous knowing what C’rizz’s definition of “saving” is. I’m ready for Charley to leave. It’s not a knock on India Fisher by any means, but ever since the events of The Next Life Charley really hasn’t had a chance to do anything other than be in some sort of peril, reactive instead of proactive.. The character growth from Storm Warning to Neverland and through her time in the Divergent Universe has just flat-out stalled. Where C’rizz gets just a hint of characterization, Charley is the typical damsel in distress, running with the prisoners from the brain worm for most of the story and proclaim there is no way the Doctor and C’rizz could be dead. That’s really it. It’s very disappointing to see Charley, Edwardian Adventuress, without any type of story or progress. I know Charley’s time with the Eighth Doctor is coming to an end, and it feels like I’m a horrible person to say that I’ve looking forward to the exit of Charley Pollard and the introduction of Lucie Miller. The supporting cast…eh. 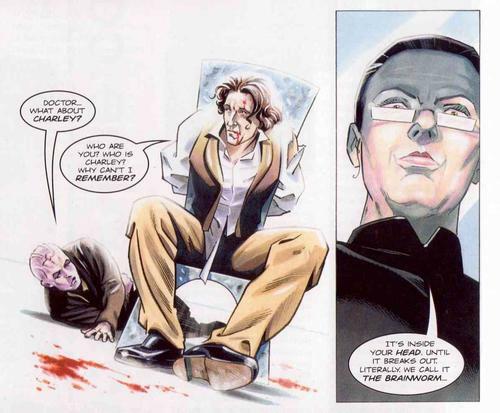 While their purposes are laid out in exposition…lead scientist Eric Rawden, played by Steven Elder, who “did what he had to in order to win the war,” lead torturer Mr. Twyst as played by veteran Big Finish actor Ian Brooker, leader of the psykes Gorden Latch as played by John Killoran and his partner Jane Thirgood as voiced by Louise Collins, and the most powerful of the psykes, the reclusive Tessa Waylund done by Liz Crowther…very rarely do they (aside from the lead torturer, Twyst) actually DO anything related to their roles aside from telling or being told about them. Latch and Jane spent their time running from the brain worm trying to escape the Cube, Rawden attempts to deduce the nature of the brain worm while keeping the psykes locked up, and Twyst…well, tortures C’rizz. Tessa gets the most development as the most powerful psyke, but just barely. As mentioned earlier, this adds very little emotional weight to their actions and demises, especially with Something Inside’s “kill em all” ending and a major sacrifice from one of the characters. The sound crew for this story went the minimalistic route, with the Cube being portrayed as an enclosed metal prison where voices echo in the cavernous space, as well a lot of running on grated floors and the brain worm’s presence announced as a roiling, crackling ball of…something that closes in on its would be victims. The synthesized score, though…the best way to describe it would be “the background music to Blake’s 7 done on modern day insturments.” It’s not a bad score, but it sometimes comes off a a sharp contrast to the stripped down sound effects. Something Inside is an improvement on The Dark Flame, flowing in a more natural sense with a unique enemy and a rising sense of tension throughout the story. I really liked this story, and over time might consider it one of my favorite Eighth Doctor stories, but there’s no overlooking the story’s many flaws. The first and second episodes as just so flat and cliched that the listener’s interest is barely maintained. The action picks up in the third episode and the fourth episode is very solid, but the low quality of Something Inside first half makes the story one that falls squarely into the “C+” range. Colin Baker is the Doctor in…The Nowhere Place. This entry was posted in Big Finish Review and tagged 3/5, Big Finish, Big Finish Audio, Big Finish Review, C'rizz, Charley Pollard, Conrad Westmaas, Eighth Doctor, India Fisher, paul mcgann, TARDIS. Bookmark the permalink.